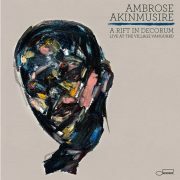 Ambrose Akinmusire: "A Rift in Decorum: Live at the Village Vanguard"
Like many live jazz albums, A Rift in Decorum amplifies Ambrose Akinmusire’s best qualities (his beautiful, penetrating trumpet sound and postbop melodies) as well as his worst (his proneness to being too hip for the room). It’s hard to say which is more powerful. But given that the album stretches over two discs, Akinmusire’s excesses may have the edge. Its high points are as good as anything the trumpeter has ever done. On the midtempo musing “Maurice & Michael (sorry I didn’t say hello)” and the bereaved “Moment in Between the Rest (to curve an ache),” he plays long, elaborate lines that are rich with information. He also surprises with what he doesn’t play; the centerpiece of “Withered” is a boiling drum solo by Justin Brown, which also raises the temperatures of pianist Sam Harris’ and bassist Harish Raghavan’s ostinati. One expects Akinmusire to similarly gather steam; instead, he keeps the beat like a soldier calling cadence. Akinmusire isn’t the only player who impresses. Harris likes to challenge time, shrugging it off on “Maurice & Michael” and seeming to trip over it (gloriously so) on “Trumpet Sketch (Milky Pete).” But Harris’ playing is also the first hint of the cerebral self-indulgence that shadows the album. Some of his solos (“Response,” “Taymoor’s World”) venture into Cecil-isms that are about abstraction for abstraction’s sake. As well, the ambition of some of Akinmusire’s compositions can sabotage them. “Withered” has a form that is frustrating to try and make heads or tails of, and “Piano Sketch (beyond enclosure)” changes tempo every eight bars; it’s exhausting. Both “Piano Sketch” and “Condor” also indulge the taxing trend of making separate tracks out of the extended intros. “Condor,” incidentally, contains a glaringly bad edit in its opening theme statement. But in this case, more edits might have helped.